IT IS WITH HEAVY HEARTS AND EXHAUSTED SOULS THAT WE'VE HAD TO SHINE THE LIGHT OF TRUTH ON THE HSUS SPONSORED "HOOFIN IT" EVENT WHICH, FOR ALL ITS EGREGIOUSNESS, WAS ONLY ONE OF THE COUNTLESS EVENTS AND PARTNERSHIPS THAT HSUS HAS HAD WITH ANIMAL KILLERS FOR YEARS. HSUS' CRIMES AGAINST THE ANIMALS HAVE BEEN HIDDEN IN PLAIN SIGHT FOR ANYONE TO SEE. Although our original 4 night Vigil series was intended to present the perpsective of the "hoofed animal menu's" victims during each night of the horrific event, the entire Vigil is also meant to expose a much larger, more pervasive trend that has been embraced and represented not only by HSUS, but by most large animal "rights" organizations, as well as major sanctuaries. 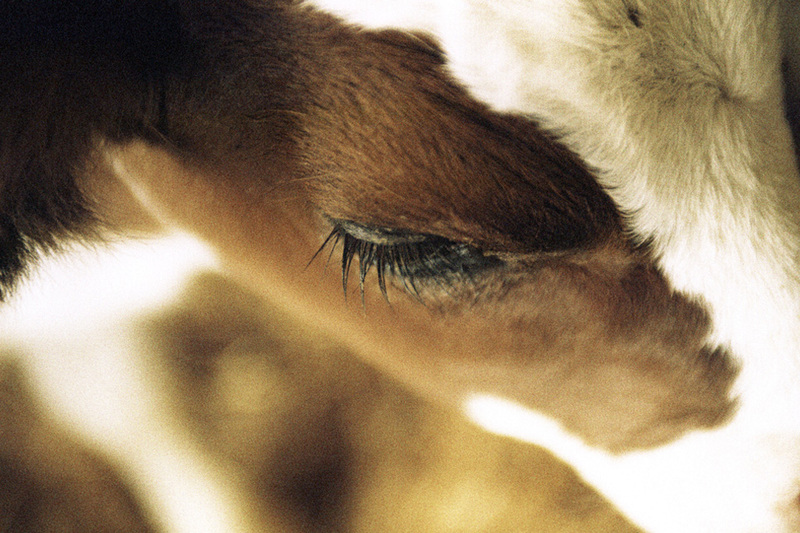 Their insistence on using the language of "factory farming" rather than "Animal Farming", and their focus on "humane" reforms—which imply that animals can be enslaved, raped, kidnapped and murdered "humanely"—is what opened the flood gates for events like the HSUS sponsored "Hoofin It" atrocity, and many others. This was not the first of its kind and will not be the last of its kind—sponsored by, sanctioned by, and created by the animals' advocates' refusal to include ALL animals in their advocacy. What we've seen is a swapping of one group of victims for another, and organizations calling it "progress", "victory for the animals", "a step in the right direction". What we've seen is that huge multinational corporations (Tyson, Goodtimes Burgers, Chipotle...) are now using the language that animal protection organizations have given them, to promote the sale and consumption of "non factory farmed" animals. What we know is that, when confronted with the horrors of factory farming, the public's default response is now to look for products of animal misery that are labeled "humane"—thereby increasing the demand for animal suffering and death— instead of understanding that the only way to end this massive injustice is to become vegan. At Peaceful Prairie Sanctuary, we know the victims of all animal farming, and we know that our job as their advocates is to tell the public—and Vegans— the whole truth about the cruelty and injustice inherent in all animal farming and use. We call on all vegans to please realize that the consequences of opposing "factory farming" instead of "all animal farming" are devastating for the animals. Promoting the feel-good lie that "humane" farming is, or can ever be, anything but an atrocity results only in increasing the demand for its blood products and, with it, in perpetuating the horror that the victims are forced to endure under the label "high welfare". Please use your own advocacy to educate the public about the vegan imperative (not the "humane" alternative), and urge all animal protection organizations and sanctuaries to do the same.